Background: Contraceptive pills continued to be one of the most common methods of contraception used by majority of women. Across all ages, women in their twenties are the most likely to use oral contraceptives (OCs). This study aimed to estimate the prevalence of use of OCs and assess the knowledge, behavior and practice of OCs among women living in Riyadh, Saudi Arabia. 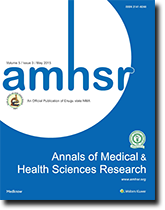 Methods: A cross-sectional survey of 477 Saudi women residing in Riyadh city of Saudi Arabia was conducted using a validated self-administered questionnaire. Results: This study had a high response rate of ~96%. The majority (76.4%) of the respondents were in the age group of 21-30 years and nearly half (52%) of the respondents were married. Most of the respondents (~78%) had good knowledge about OCs in relevance with pregnancy prevention, however only 31.6% females knew the use of OCs for menstrual cycle regulation. More than half of the respondents (57.1%) use OCs, of which 79.9% were married and 36.7% were regular users. Among the users, 62.1% use OCs as a contraceptive pill, 25.75% use OCs for menstrual cycle delay, 9.1% use OCs for therapeutic purposes, and 1.5% for some cosmetic purposes. The practice of OCs has been revealed by the users for delaying their periods during the religious Islamic Pilgrimage Hajj/Umrah (61.7%) and fasting month of Ramadan (31.1%). The majority (89%) of OC users observed at least one side effect, however a small population of OC users (7.2%) experienced many side effects. Married OC users reported significant weight gain (OR=2.4; p= 0.005) and headache (OR=1.86, p=0.045) in comparison with unmarried OC users. Conclusions: The present study warrants for systematic public educational programs for women’s awareness regarding the use and practice of OCs and implementation of strict guidelines to regulate the use of OCs in a safe and proper manner to avoid ill effects on women’s health.